According to Allkpop Link: My Love From The Star was the highest rating K-drama in Korea. It even breaks it's own record during one of the episode. Have you watch this drama? How do you feel about the characters in this show? Is the storyline engaging and creative? What are the things you like or dislike about this drama? 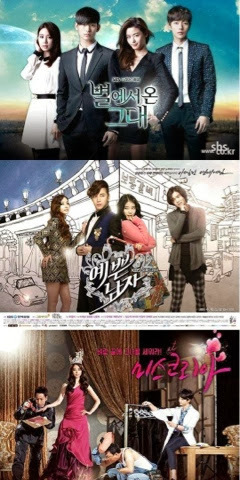 I personally like this drama because of the storyline, characters and the way the story was told. The pace is just nice for me since I really dislike draggy and boring type of show. This romance comedy is always what I liked. The chemistry between the main leads was so good since this was their second collaboration. Kim Soo Hyun acting had matured so much and is becoming a creditable actor at this young age. He matches Jun Ji Hyun style and carries himself very well. I am still in the midst of recapping the drama since I do have many things to share. Looking forward to the future episodes and I wonder how will the scriptwriter tie up the loose end? I am keeping my hope up!